BEACH FRONT--BEACH FRONT--10 STEPS AN YOU ARE ON THE SAND!!! Relax and Recharge at our Mexican Villa. This home has wonderful colored furnishings, Mexican hand carved doors, outstanding tile designs and is so close to the water you can watch the seagulls play and the pelicans made their V pattern as they skim the water. Dolphins go by every morning ... it truly is an Enchanted Beach. The beach is the most beautiful in Rocky Point - no rocks. You can walk or run for miles both East and West. 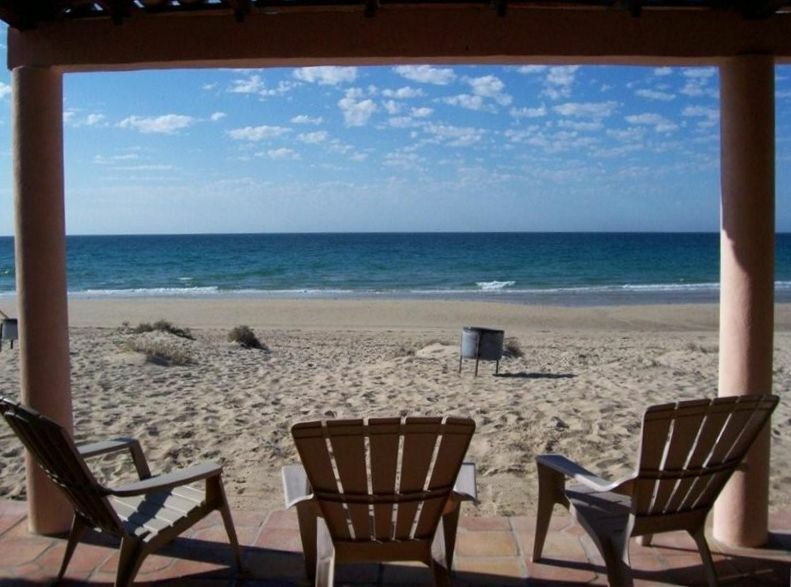 Under the covered patio enjoy the Sunrise and Sunset since the Villa is facing south looking at Bird Island to the East and San Felipe across the Sea of Cortez to the West. We have the Mexican firepot right on the sand in front to sit around and cook those yummy smores. This is truly a family vacation beach and we have all the amenities, from Mexican charcoal to cook the steaks or tequila shrimp on, to comfortable spots on the patio or in the house to read, relax or catch a movie on Direct TV. Come with your family to enjoy a week on the beach you will never forget! PS: If you have to work a little--we have free satellite service for internet access.